There are a few new shows debuting on HGTV Canada this week. Which ones will you be watching? Premise: Battle On the Block is a fun, character-driven home makeover show where three neighbouring families compete against one another in an effort to design and build one new room from scratch, all in the span of a single weekend! The winner not only gets $10,000 but also bragging rights in the neighbourhood. Will I be watching? This sounds like a mini version of my favourite all-time home show, The Block. But I can can only take so much of Genevieve Gorder and her baby voice. Might watch. Premise: Design Star champion, David Bromstad, won a slot as host of the new series, Color Splash. He brings his exuberance, passion, decorating savvy and unwavering belief that "color is the root of great design" to transform tired rooms for homeowners each week into vibrant, unforgettable spaces — while he teaches us to do the same in our homes. Will I be watching? You bet!! Premise: Think buying your first place is tough? Try selling it! My First Sale takes the proven and successful docudrama format of My First Place and turns it upside down — telling the story from the seller's point of view. Selling your first place means the stakes are even higher than when you purchased. More pressure, more jeopardy, more to gain — and potentially thousands to lose. For HGTV viewers, My First Sale has even more drama and, most important, more valuable takeaways to help viewers make top dollar on their own sale. Will I be watching? Probably, but might get bored of it after a while. Premise: They are assertive, razor-sharp and always compelling real estate brokers in the country's most competitive market. In a city of over 8 million people, where the average sale price is over $2 million, the competition to seal the deal is stiff. Now, catch a rare glimpse into a world where a solid reputation at the top of the real estate food chain involves swimming with the sharks, going head-to-head with the best, and rubbing shoulders with the wealthiest and trendiest of New York's social, political and artistic elite. This is Selling New York. Will I be watching? Sounds to me like the New York version of Million Dollar Listing, which I can’t stand. Might watch the first episode out of curiosity, but I’ll probably be turned off by the exorbitant prices and potentially pretentious buyers. As for the new HGTV schedule — why do they insist on Holmes on Homes repeat overkill?? He’s still on at noon, 6:00PM, and 11:00PM every day. I assume they need a certain percentage of Canadian content, but there are so many HGTV US shows that we don’t get here — why not give us a few of those instead of showing constant repeats of the same Canadian shows?? I really like the sound of My First Sale (I'm a wannabe real estate agent!) and I also like Selling New York because , unlike you, I LOVE Million Dollar Listing! Thanks for the update and the synopsis of each show! I might watch the Colour one but pass on the others. I don't watch any I find the constant commercials a problem. woo.. I love it when you introduce new shows to us! And yes, I'm really getting tired of Holmes on Homes. Even I recognize the repeats, and I don't follow it religiously... Are they done with "Million Dollar Listings"? I don't even know who watches that show! It's so boring.. and I can't stand those brats! I'll join you in watching Color Splash. I'm soooo fed up with "forgettable" spaces! I'm actually house hunting now, and probably 50% of the homes I've toured, I don't remember! Selling NY is NOTHING like Millionaire listing, thank god. It's one of my favorites down here in the States. As is David Bromstad's Color Splash Miami. His first season was plain old Color Splash, in CA, and he was on a budget - now in his second season, in his hometown of Miami, he's got a seemingly unlimited budget and WOW pops of color all over the place - I LOVE that show! We have the other shows too...but I don't like them. Have fun tonight! The Block 2010, Aussie version, starts here next week ! It's not fair, I want to see these shows too! Totally with you on all of it...except I think I will love MDListing, since I often surf Manhattan real estate and dream of what I can't afford. And the Holmes on Homes thing...so over that show...talk about oversaturation! When I go to the states, I love watching their HGTV, and last time I watched 9 on Design (I think that's what it's called)...love that family and show! I noticed we got one episode recenly on Canadian Bravo, and it's got to be more than 3 years old. Truth is, after working on some episodes while at a HGTV designer's firm, it's lost it's romance, and I'm sick of not seeing real design on the network. My fav shows are the ones where they actually show the work, and the timeline is realistic. You'll have to tell me how they all are. I spend so much time blogging now that we git rid of cable! Of course, I'm hoping to still be able to watch a few things on line. I wonder if HGTV Canada is going to pick Secrets of a Stylist. I like the looks of that show. I'm looking forward to seeing Selling New York! I like shock value of real estate prices, although I'm sure I will be annoyed by the buyers... And agents. I do like to watch David B. on Color Splash. I just think he is phenomenally talented on many design and color fronts. The commercials can be a kill-joy to the show, I agree. I have the DVR set to record all the new episodes. Otherwise, I just can't sit there and endure! I can help you make your home be what you want it to be. Design Trade - Home Office Winner!! 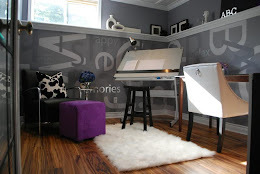 Kelly has WON for the best Home Office in Design Trades' "Give Us Your Best Shot II" competition! We're two Canadian chicks who love everything about interior decorating and remodeling. We demo! We paint! We tile! And then we write all about it here on our blog. Click the pic to check out some of the artisans who will be at the Handmade Harvest Craft Show in Almonte, Ontario on November 6th. Layers & Layers & ..
OMG! Alicia B. 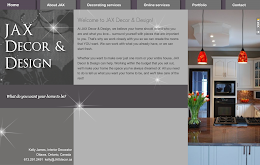 Designs has moved! 5 Things You Didn’t Know About Me! Specialist or Generalist? One Style or Versatile? On my mind... have you voted yet? Maskros: Go big or go home! Finally, my secret is revealed!! Did you buy an Art for Life painting?? Art for Life Campaign ~ Close to the finish line!